If you want to gauge Microsoft’s changing attitude toward PC gaming at any given point, look at what it’s doing with Age of Empires. The long dark age of Games for Windows Live was heralded by Ensemble Studios’ closure in 2008. And renewed efforts to “up Microsoft’s gaming presence on Windows” have seen the company take stock in recent months, releasing extended editions of Age of Empires II and Age of Mythology on Steam. What are we to make, then, of Castle Siege? A touchscreen-focused Clash of Clans homage found only on the Windows 8 Store? 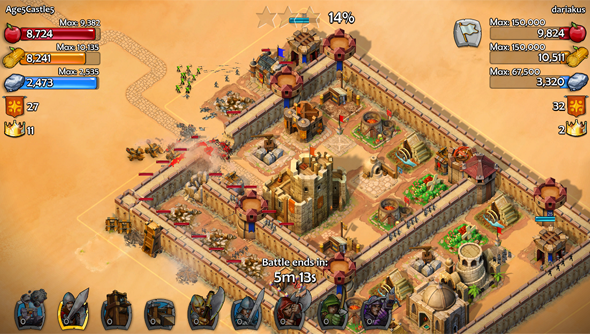 “Castle Siege brings a fast-paced experience to touch-based screens while delivering all the strategy and combat Age of Empires is renowned for,” write developers Smoking Gun Interactive. You’ll pick a civilisation, build a city around your starting keep, and do your utmost to keep its walls upright during assaults from “marauding empires”. Then you’ll take your own army to lay siege to the castles of other players. Smoking Gun maintain they’ve preserved the “expansiveness” of Age of Empires in Castle Siege’s resource-gathering and troop-training elements. And they’re keen on the level of strategy they’ve managed to bring to touchscreens: the gentle prods of castle-building will give way to dramatic swipe-commands during battle. “Using this tactical control to counter your opponents’ defenses is crucial to victory,” say the dev team. Ensemble were never afraid of a dalliance with a demi-god or historical figure, and Castle Siege will enable players to call down Richard the Lionheart or Charlemagne as hero units. Each of its six civilisations have access to unique “cultural” units, and you’ll play through ten historical battles: including the Siege of Marienburg and the Fall of Constantinople. There’ll be cross-platform play with Windows 8 phones, tablets and phablets via the service Microsoft are now calling Xbox Live. Think you’ll be trying out this spin-off curio come September?